Supporters of Justin Trudeau and his Liberal government are jumping up and down for joy on Twitter, as well as insulting my intelligence because Trudeau announced a super-awesome mega deal just a day after I critiqued him for using our money to take his family on a vacation to India. Turns out I’ll stand by my comments because if you look past the headlines as any good journalist should, this deal is minor in the scale of Canada’s trade with India and Canada’s trade globally. We should be expecting more. Initially this was reported as a $1 billion dollar investment in Canada by Indian companies, that is what the PM said from the podium according to CTV reporter Omar Sachedina who is traveling with Trudeau. Now I realize that the news release says $1 billion “between Canadian and Indian companies” but Sachedina and others also reported what Trudeau said and then his office clarified. Okay, so $250 million invested in Canada but $750 million into India from Canada, that could turn into Canadian jobs if our products or goods are part of the deal. But they aren’t. Don’t take my word for it, here is CBC’s coverage. Most of the jobs will come from $250 million in new investments by Indian companies in Canada. Canadian companies will also invest $750 million in India. The lion’s share of that Canadian investment is Brookfield’s acquisition of a Mumbai office complex currently owned by an insolvent Indian company. So a three for one investment deficit there. And according to government officials that $250 million worth of investments in Canada will be taken over several years. Yes, these investments are said to be creating more than 5,800 jobs but that many jobs created in a monthly jobs report would be considered anemic growth so over several years it is small potatoes. 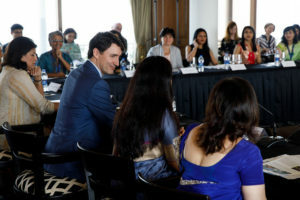 As for Canadian investment in India, don’t expect a bunch of our goods and services to be heading that way, two deals make up the bulk of the investment according to The Canadian Press. More than half the $750 million Canadian investment in India comes from Toronto’s Brookfield Asset Management, which is spending $480 million to buy a 1.25 million-square foot office complex in Mumbai. Those are Canadian firms buying up significant Indian assets but it won’t mean much for jobs here. The other factor you have to consider is the size of Canada’s two way trade with India. We are currently in ongoing talks to expand trade with a country that remains protectionist. According to the Trudeau government’s own web postings, trade has been growing. Bilateral merchandise trade reached nearly $8.3 billion in 2015, an increase of 29 percent since 2014. Two-way investment flows totalled more than $4 billion at the end of 2015. Deals worth $1 billion and spread over several years, with most of the benefit going to India, is not what we should be expecting. We currently do $1 billion a day in trade with the United States, we should want to grow that but also diversify. In an attempt to do just that Stephen Harper focused on expanding trade agreements around the world. Deals were inked with Peru, Columbia, Panama, Jordan, the European Union, the TPP and others. A framework with India was set up to liberalize trade in 2015, before the election. If Trudeau were taking India more seriously, say as serious as he takes China, then we would have more. India is a growing economy with a middle class that is constantly expanding. It is a country that has democratic roots, a legal and political system that is closer to ours and doesn’t come with the dictatorial regime in Beijing. India needs to be a priority, not a vacation spot. Now for all those pointing to the several very quick business meetings on today’s itinerary, let’s compare that to Saturday where they showed in New Delhi for no reason, Sunday where it was tourism all day with one roundtable at 5pm, Monday where it was tourism all day save for an “armchair discussion” and one meeting with a local official or tomorrow where it is back to tourism for most of the day followed by a single meeting and a media availability. I won’t expect much on Thursday since the PM needs to get photographed in front of a mosque and Catholic cathedral still before he meets with Indian PM Modi on Friday and then jets home with lots of photos to put in targeted mailings for the next election. UPDATE: For everyone pointing to Stephen Harper taking two “limos” with him to India in 2012, that was not Harper’s call it was the call of the RCMP based in intelligence they had. I wouldn’t begrudge that expense to Trudeau. PM’s don’t make those decisions the security experts do based on the information they have. What I begrudge is taking up so much time on an 8 day trip for a family vacation and photo-ops to help his re-election back home. Listen to the news in India and you will see the other side of the story. They present his trip as a personal trip. Also an issue with people who travel with PM and separatist controversy. Not hard to read in you are a begruged conservative. YOU SAID THAT RIGHT BRIAN LILLEY — OUR FAMILY SAYS WE CANNOT TRUST ANYTHING TRUDEAU DOES — WHY WAS MILLIONS OF $$$ TAKEN OUT OF CPP TO GIVE TO THEM FOR INFRASTRUCTURE?? HOW IS ANYTHING TRUDOPE DOES HELP CANADIANS?? ALL WE SEE IS EVERYTHING IS FOR FOREIGNERS EVERY WEEK EVERY TIME EVERYWHERE BUT CANADA AND FOR CANADIANS — HOW MUCH LONGER CAN HE KEEP FRITTERING OUR $$$$$$ AWAY TO THOSE WHO HAVE NEVER CONTRIBUTED 5 MINUTES FOR THIS COUNTRY WHILE TRUDOPE IGNORES OUR VETERANS AND SENIORS??? THIS IS MADNESS — HE IS NO PRIME ANYTHING — BUT IS CLEARLY A TRAITOR TYRANT LIAR TERRORIST AND ISIS SUPPORTER AND TERRORIST MILLIONAIRE MAKER!! !